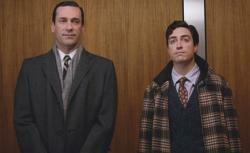 Mad Men recap: Ginsberg is a younger Don. Don pulls rank on a younger version of himself. Happy Thanksgiving indeed. After making do last week with a meager episode that was short on plot development and thin on jokes, we more than made up for it with a heaping plateful of both this evening, and a shot of whipped cream on top. All that and a glass of Manischewitz. I think I may have gained. The biggest event, or non-event, this week was Betty’s abortive effort to “poison” Megan and Don’s relationship from 50 miles away. It was a visible strain on poor Betty to cross the threshold into Don’s Upper East Side pad and observe her slender successor slipping into a mod outfit. Megan greets Betty’s perfunctory compliment about the apartment by saying “Thanks. I think you’ve seen most of it,” with a discernible territorial edge. Henry continues to seem like a sweet and decent guy, sneaking downstairs after hours to burn himself a steak, because his sympathy diet of “fish five nights a week” just isn’t sustaining him. (I’m guessing he doesn’t know about the whippets.) But as he realizes that Mayor Lindsay is not going to make a presidential run, Henry comes to the conclusion that he “bet on the wrong horse”—and it’s hard to escape the feeling that Betty might be thinking something along those lines too. Discovering Don’s tender nothing scribbled on the back of Bobby’s homework is the final straw. And wouldn’t you know it! Sally just happens to be working up a family tree. What did you two make of Betty’s decision to tell Sally about the original Mrs. Draper? It ended up being a non-event, one that only underlined the ways in which for Don, at least, the times have changed. Betty clearly didn’t anticipate that Don’s new wife would already know all, so her effort to strike at Megan ended up missing its intended target—and connecting, instead, with her daughter. “Your mother doesn’t care about hurting you,” Don tells Sally, “she just wants to hurt us,” and that seems true—doesn’t it? Once again, I find myself wanting to sympathize with Betty’s predicament, only to be repulsed by the way that she handles it. We’ve remarked before that Sally is beginning to show the mark of her mother—the prissy hauteur, the temper, the food issues. But after Sally overheard Megan’s (rather astute) diagnosis of Betty’s tricks, it was interesting to watch the daughter use this new information to employ a few tricks of her own, playing on Betty’s insecurity by adding that gratuitous detail about them breaking out the photo album to admire faded snapshots of Don’s first wife. Here’s what’s troubling about this: Don’s decision to abandon Ginsberg’s sketch in the taxi is not a Don Draper move. Rather, it’s precisely the sort of thing that Roger and Pete have been doing for years. The sneaky play by the guy who fears that he might lack for natural talent was never one of Don’s devices, if only because he always had so much talent to spare. I’ll certainly enjoy watching him spar with Ginsberg in future episodes, but when Don responded to Ginsberg’s boast that he has “a million” good ideas by saying, “I guess I’m lucky you work for me,” he lost my allegiance in a pretty significant way. It’s one thing to pull rank on a cowering lizard like Pete Campbell. It’s another to do it to someone who is in many respects just a younger, and perhaps more talented, version of yourself. I’m not even going to get into Roger’s caper with the Manischewitz, except to note the luxurious thread count of excellent one-liners (“How Jewish are they? You know, Fiddler on the Roof—audience, or cast?”) and the dreadful handling of hapless Jane. But I do want to reiterate my question from a few weeks back: Where is Roger getting all this dough? He was always wealthy, of course, and he acknowledges himself that he has “to stop carrying so much cash.” But after paying off Harry, Peggy, and now Michael, he’s still got enough scratch to purchase Jane a new apartment for the sake of a single dinner that might possibly land the Jewish wine account. I’ll concede that “when a man hates another man very, very much,” he may be driven to irrational things. But Roger’s promiscuous dispensation of cash dollars is confusing. And kind of hip-hop. I feel like one of us should say thank you.